Pleasing a city of time-crunched java-lovers who want nothing short of the best is no easy feat. But in the 917, where the bar is set higher than Kardashian standards, there’s practically a caffeination outpost at every corner. So, we did a little research to find the highest quality cup of joe. 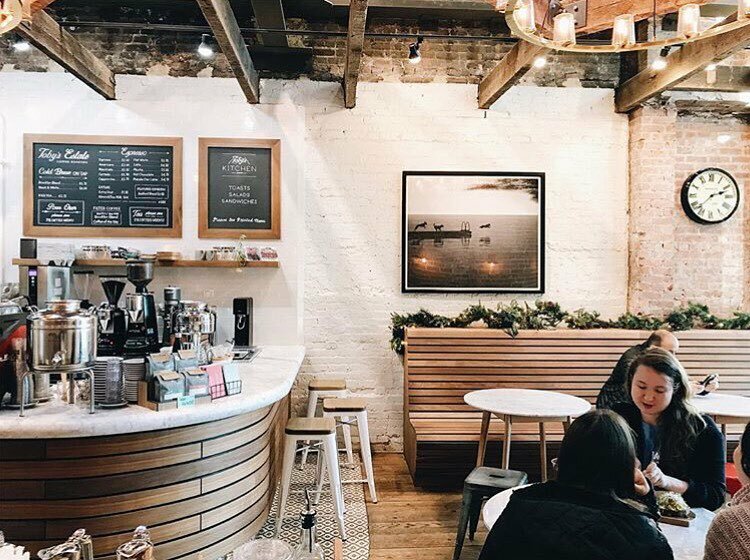 Whether you need to a nice space to post up and crank out work like your favorite author, are on the hunt for the best latte, or need a clutch date spot that’s as classy as it is quiet, we’ve got you covered with these coffee shops in NYC. 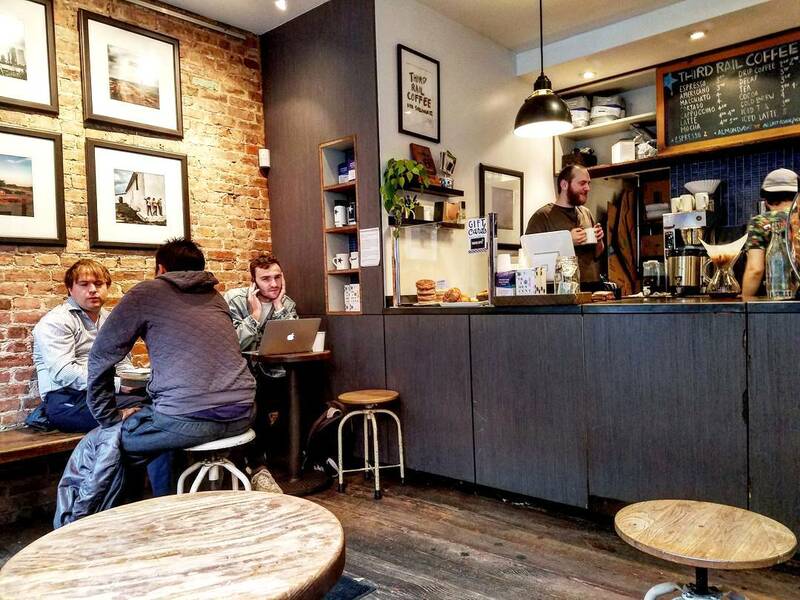 Staking their claim on the competitive corner of Canal Street in SoHo, quaint 13th Street in the East Village, and the welcoming Park Slope, this surprising, cheese wedge-shaped gem of a coffee bar has a retro-but-still-modern feel. Serving up Counter Culture coffee, handcrafted sodas, and just a little bit of ’50s attitude, pop in for a cup of superb coffee or dare to try their Espresso Old Fashioned. Yes, you read that right. And it’s not hard to imagine this taking off thanks to the rising tide of craft-cocktail culture and evening caffeine creations (just watch and remember we said it first). 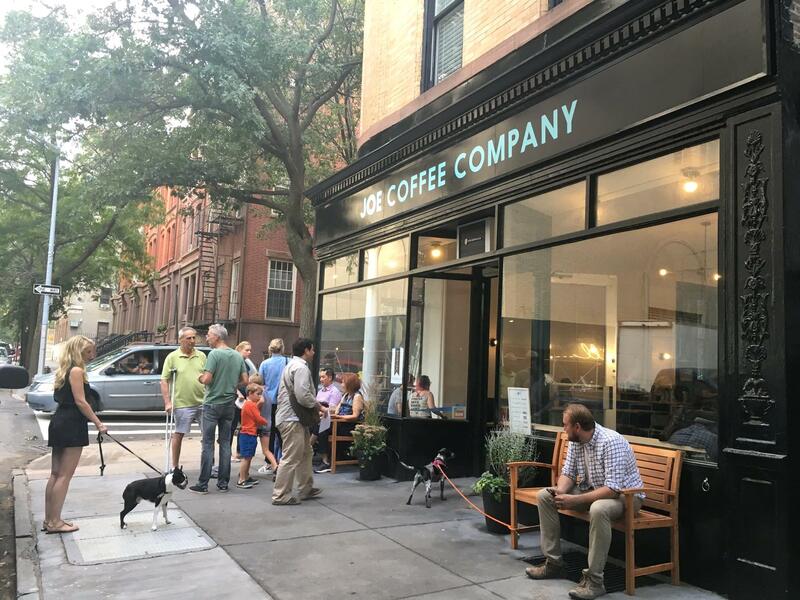 New Yorkers may have 99+ problems, but thanks to this Portland coffee staple migrating to the East Coast and popping up shop in Greenwich Village, Midtown, and Cobble Hill, Brooklyn, a bad cup of joe isn’t one of them. Whether you’re looking for a full-bodied cowboy coffee or cup with a smooth almost-tea-like finish, Stumptown has got you covered. 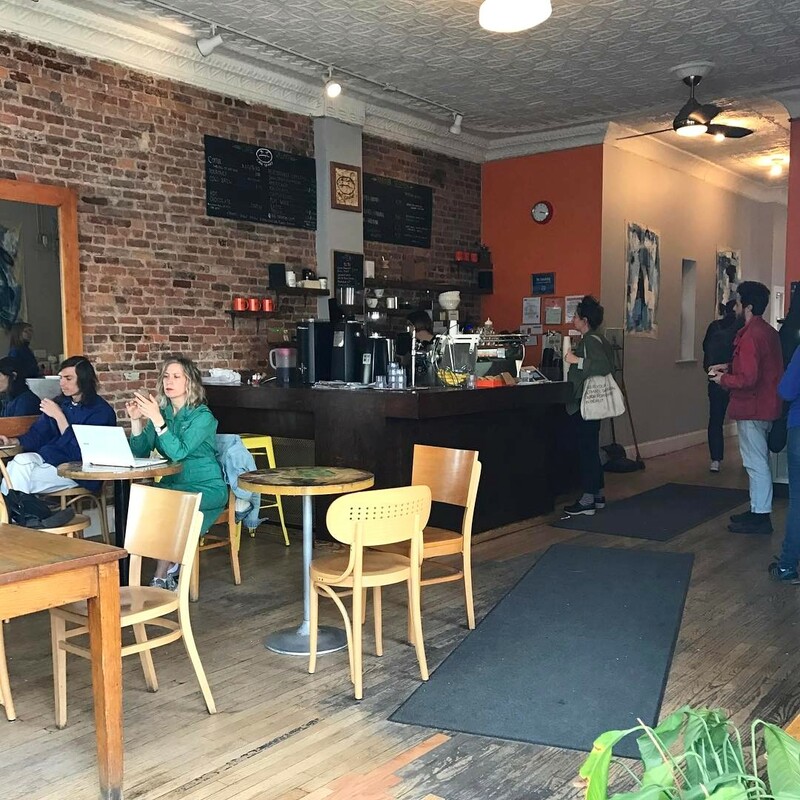 Plus, in addition to a full espresso bar, drip coffee, brew-by-the-cup offerings, and cold brew, you can enjoy pastries and sandwiches from Roberta’s, Ovenly, Megpies, and Donut Plant. 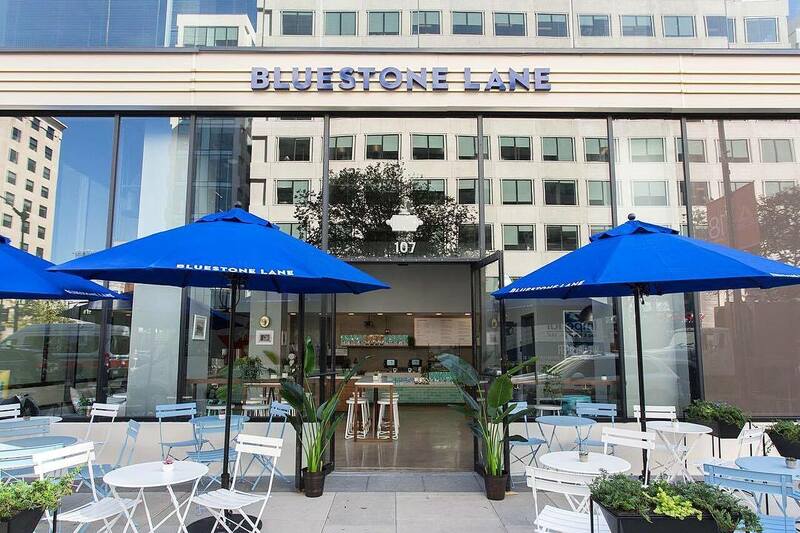 With walls made of wood paneling and ample seating lining the perimeter, the Wall Street location of Bluestone Lane is the perfect spot to read the New York Times or scroll your newsfeed while enjoying your caffeine fix. 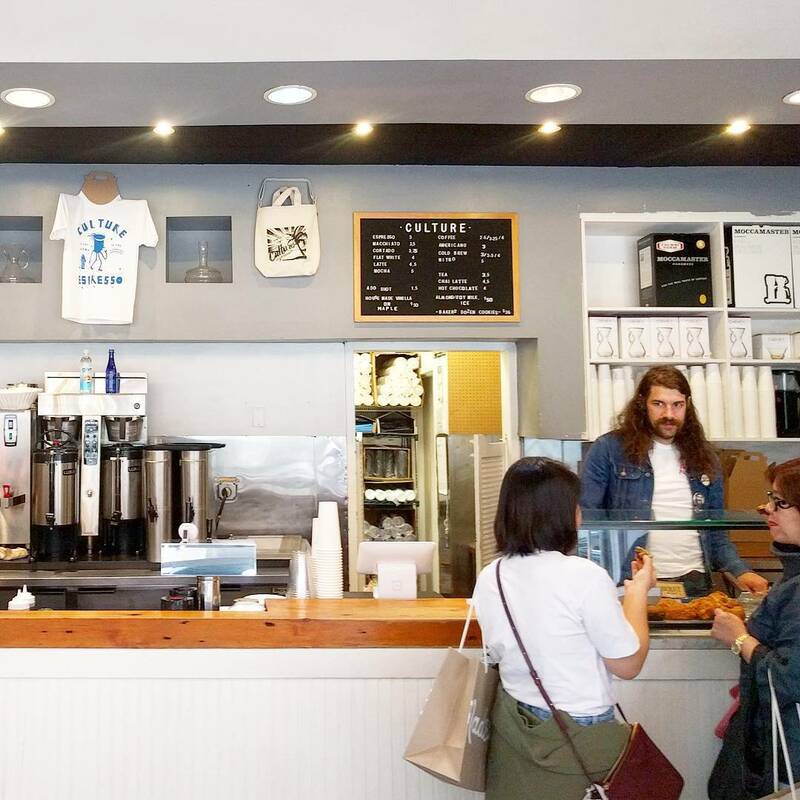 For that matter, the other 10+ NYC cafes aren’t half bad either — they’re all airy, seriously chill, and blue-toned. Run by two Aussies, the shops’ decor reflects the owners’ roots: road maps, vintage sporting memorabilia, and old Australian newspapers. 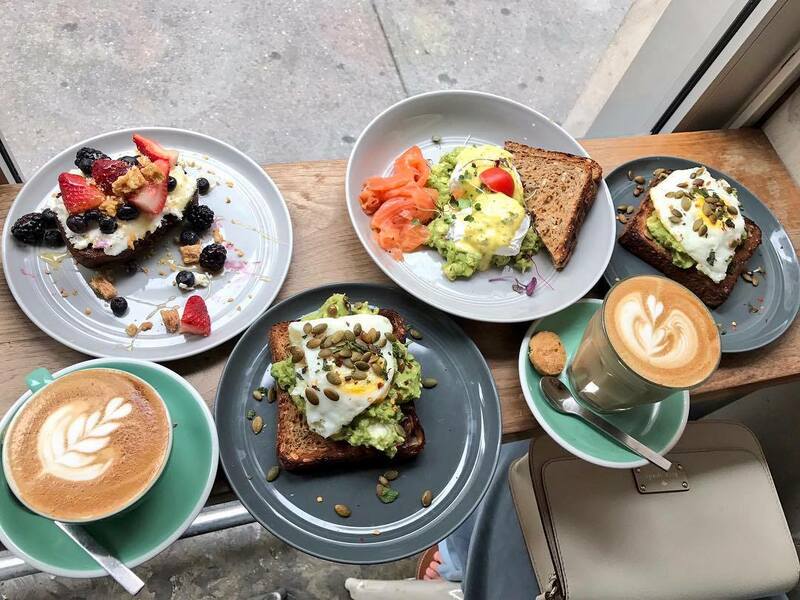 Known for their Flat White and Affogato, as well as their various toast creations (think Salmon Toast with avocado and a poached egg or Turmeric Sweet Potato Toast), Bluestone makes mornings in New York City a little less horrible. Since 2001, this Alphabet City espresso shop has kept locals awake and ready for whatever the Big Apple throws their way. Ninth Street Espresso is a real-deal espresso shop that only offers four types of coffee: hot, cold, espresso, and espresso with milk. Let’s just say this little gem knows what they’re doing — they’re as quality-driven and independent as you can get in NYC. With small wooden tables and wire chairs, you can expect to see people having quiet conversations or typing away at any time of the day. But while they now boast seven shops, the original is still the best for an old-timey feel. 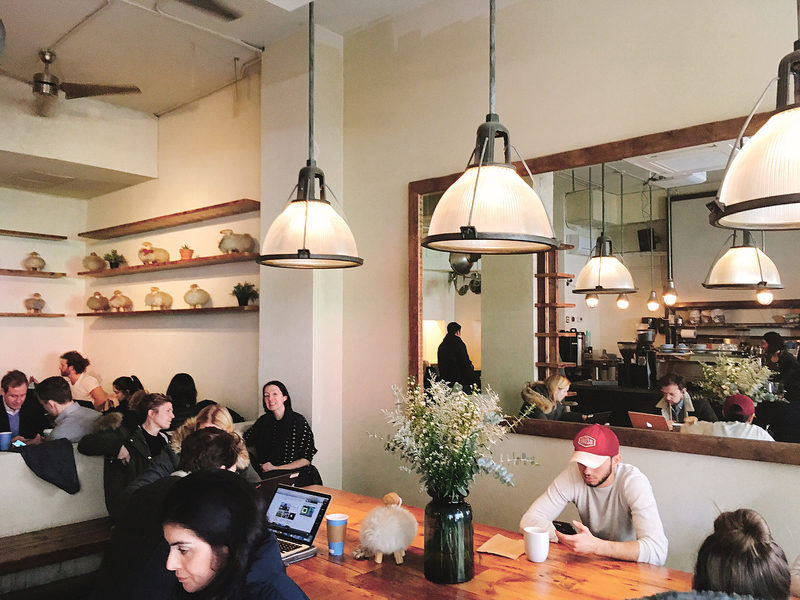 Café Grumpy opened its first spot in Greenpoint in 2005, and the success of the shop has grown it from a quiet study spot with a ‘leave one take one’ bookshelf to an eight-location giant. And Girls fans, Lena Dunham was briefly employed at the original Brooklyn spot (if you thought you recognized it). 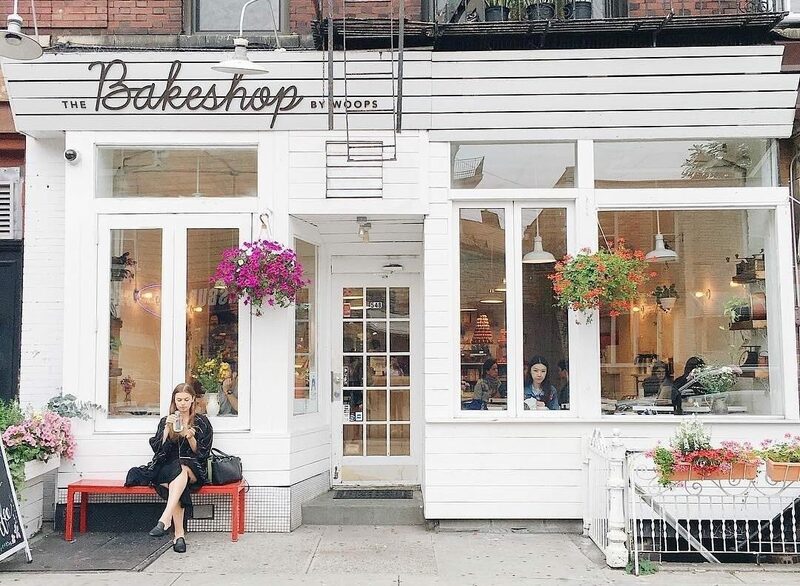 But for an in-house bakery, head to their Lower East Side spot and order one of our fave classics like Banana Bread, Corn Bread, or Almond Cake. Hang out a bit. Get some work done. Meet your neighbors. Drink some bomb coffee. That’s what this Greenpoint cafe is all about. With a name that coffee shops everywhere should envy, it’s no surprise that this spot embraces its whimsy with a red exterior, great people-watching window, and series of pun-filled signs. So hop on the G train, order some tasty brew, and enjoy a day out in the busiest borough. 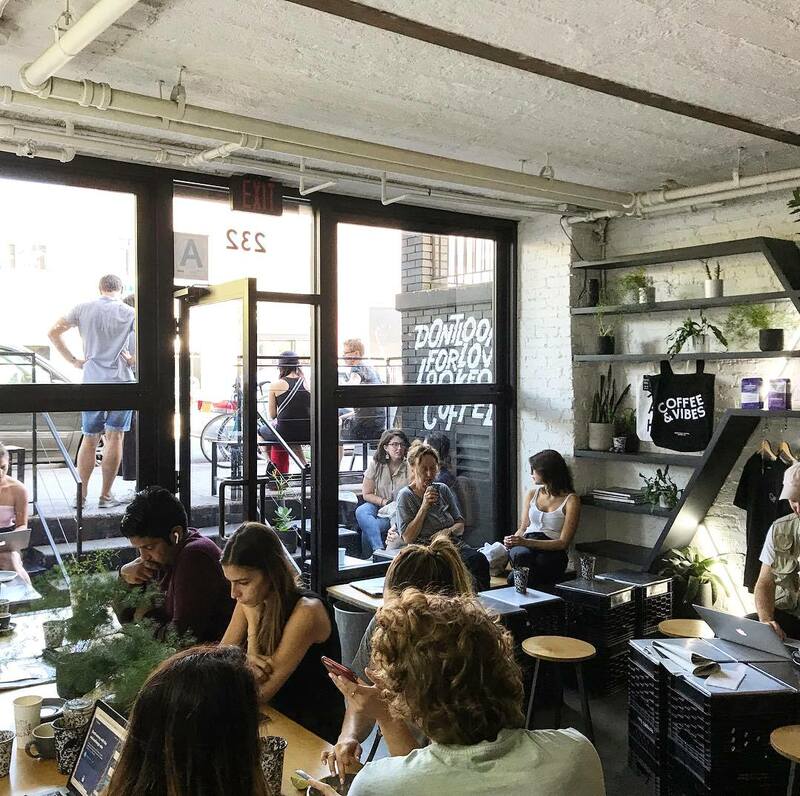 Nestled between Prince and Spring streets in Nolita, it’s no surprise that this gourmet coffee shop is standing-room only. With Americanos, espresso shots, and hot brew dazzling your taste buds, it’d be a shame to get anything but the classics. And if you must lighten up your dark roast, the dairy-averse will be happy to know they offer soy and almond milk at no additional cost. Oh, and if you cross the East River but don’t want to give up on Gimme!, you’ll find locations by both the Bedford and Lorimer stop on the L train. This quintessential coffee shop is as sleek and highly-efficient as you would expect from a six-city coffee chain. 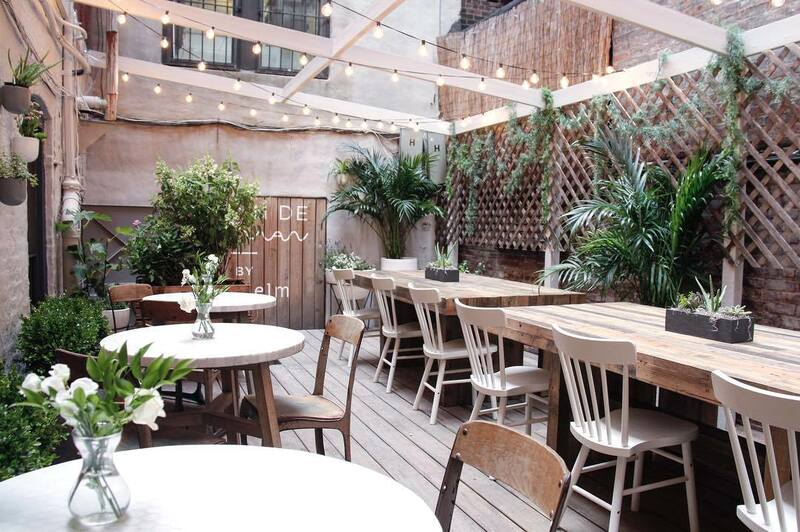 But with only one location in New York at the High Line hotel (a great spot for taking IG-worthy photos of the Empire State Building) that features an exposed-brick wall, old-school tiled floors, and a wooden bar that is a writer’s dream, it has a comfy, hole-in-the-wall feel. To get an idea of how quality the coffee is, go for a classic hot brew your first go’round, then get adventurous with lattes, macchiatos, and flat whites. 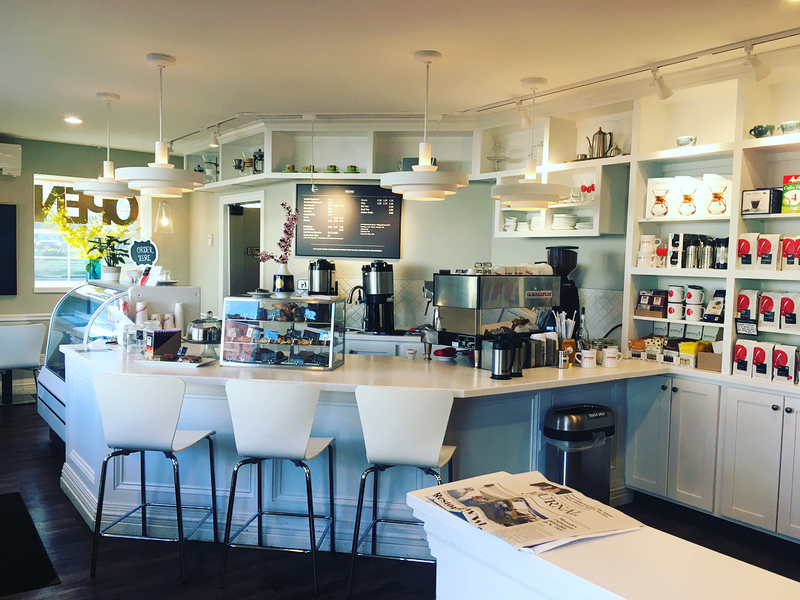 Rich coffee, homey service, and cozy feel… in Midtown? Yep, at Culture on 38th St. (and also 36th). 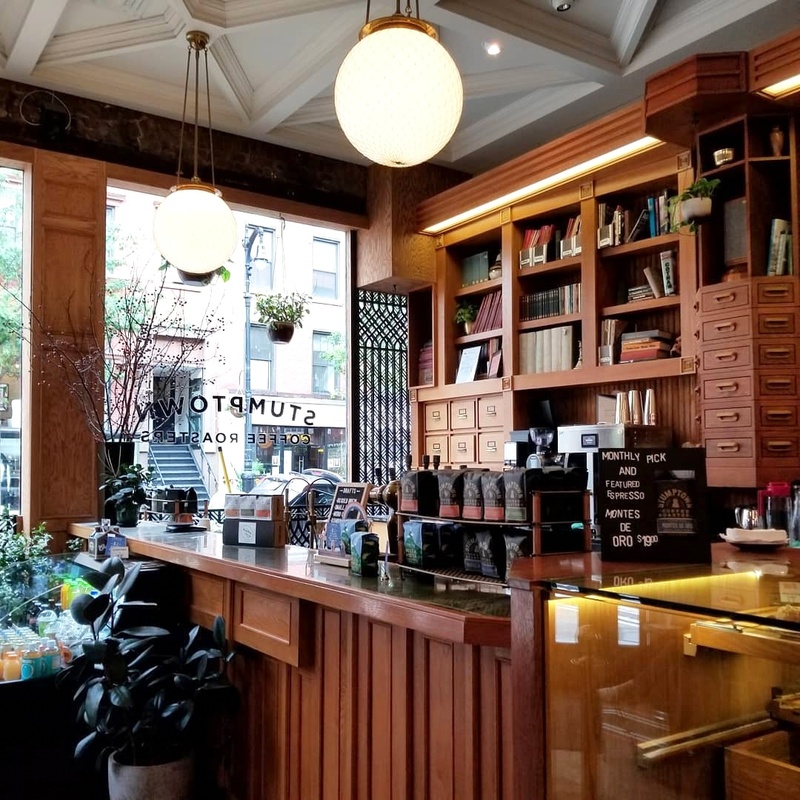 Bringing the best coffee all the way from Portland, Oregon to the heart of NYC, this espresso shop brings outstanding joe to a part of town that’s usually too busy to care. Fitt Tip: for Manhattanites who aren’t too busy for a sweet-treat, their signature Chocolate Chip cookies and Oatmeal Cranberry cookies are made in-house and baked over the course of the day. But for the largest selection of baked goods, stop in on your way to work. From the stylish, industrial interior to the delicious, no-nonsense menu to the (often alternative) music that fills the space, Little Collins hits all the senses and makes people feel both transported to Melbourne (LC is yet another Aussie spot) and completely at home, all at once. Whether you’re craving an espresso or pour-over (we recommend the Idido), or looking to nom on some avocado toast, you can’t go wrong. 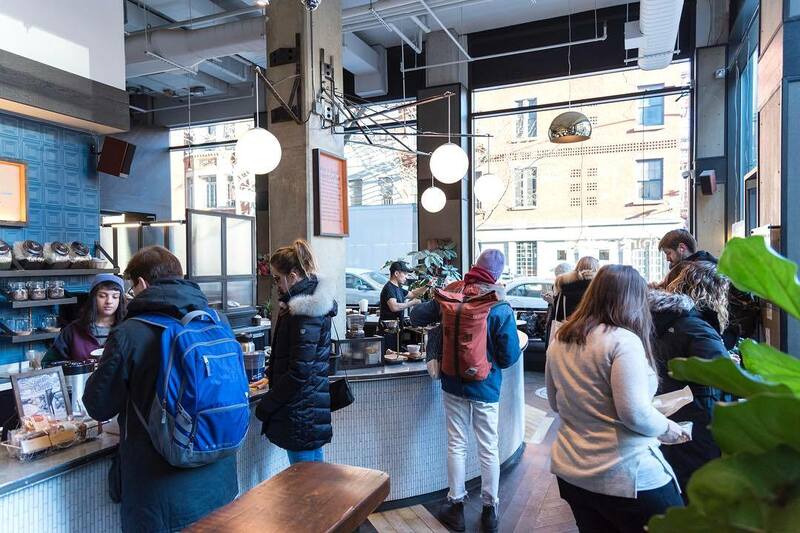 Plus, they’ve got a fancy under-the-counter coffee brewing module known as Modbar, and although there’s almost nowhere to sit, the coffee and house-made schnitzel make it stand out on this list. Make sure to confirm which Kaffe 1668 you’re meeting your date at — there are two just a few blocks apart on Greenwich Street in Tribeca, and then a third in Midtown. But shout-out to the original near Chambers for its two levels of seating and abundance of (fake) wooly sheep. 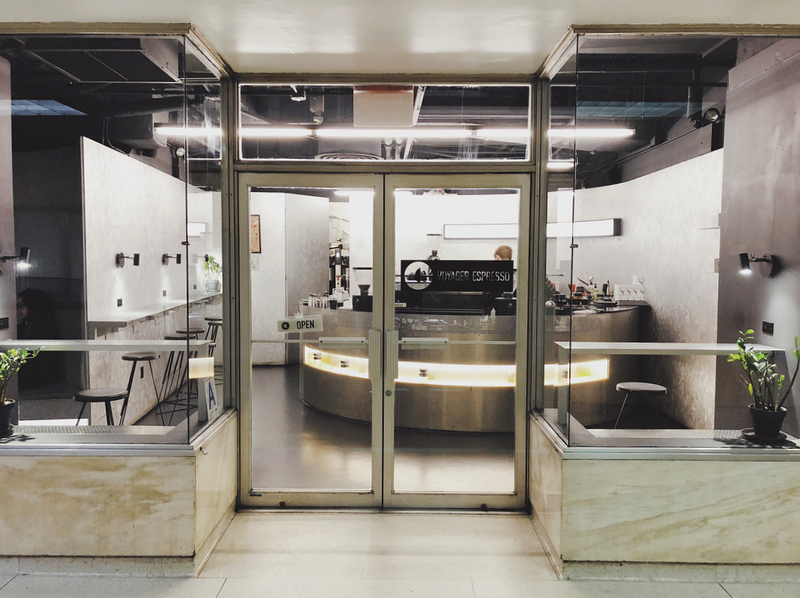 At any of the three, expect pour-overs in seven flavors, 10 kinds of espresso drinks, and both hot and iced matcha lattes. Plus, they’ve got all-day breakfast. With smoothies like Nuts 4 Protein and The Green (That Tastes Good!!! ), and plates like Sage & Scallion Omelette Wrap, Kaffe 1668 knows what its Tribeca community wants: high-quality, trendy eats at a decent price. Coffee-loving Manhattanites are clutching onto their Joe Coffee cups to get their morning fix. 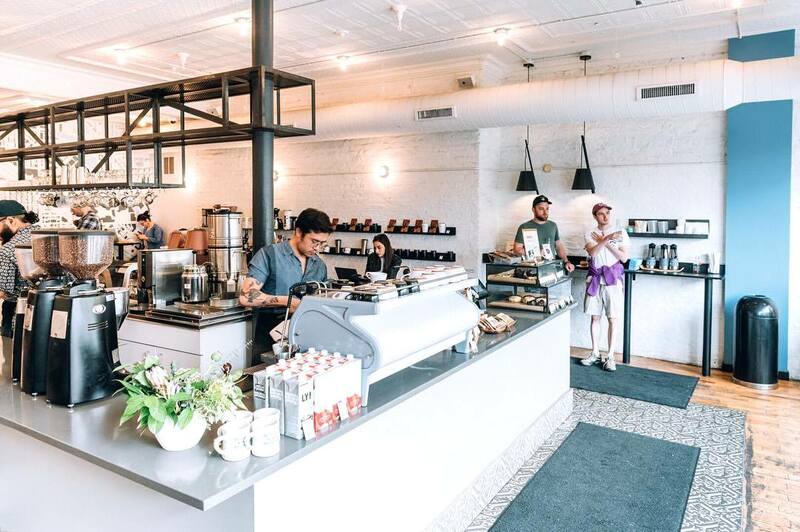 With fourteen locations in the more-chaotic borough (shoutout Manhattan) and one in Brooklyn, Joe’s is hardly a hole-in-the-wall, but they’ve got the highest quality coffee in the city — largely thanks to their own roasting operation in Red Hook, Brooklyn. 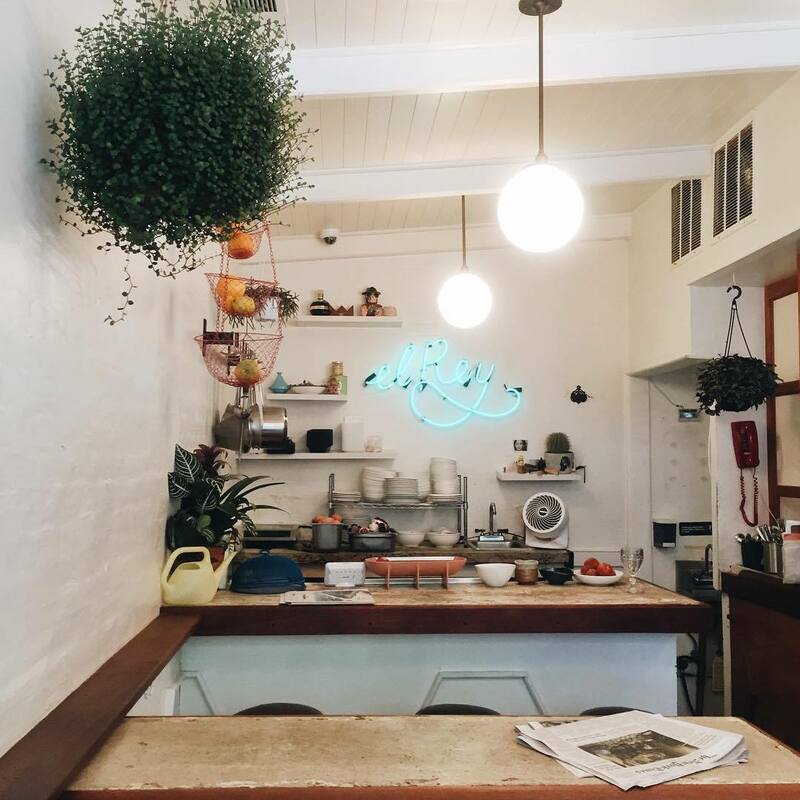 If you’re looking for a place to sit and spread out (or just stare at their beautiful light fixtures while the buzz kicks in), hit up their Upper East Side location. But if you want a more “intimate” feel, their West Village shop is where it’s at. 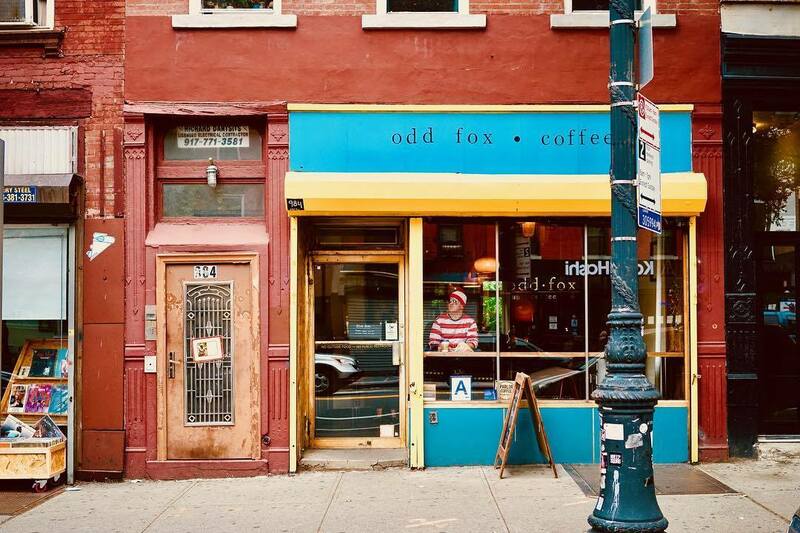 Close your eyes and picture where you think the quintessential well-to-do hipster goes for coffee. 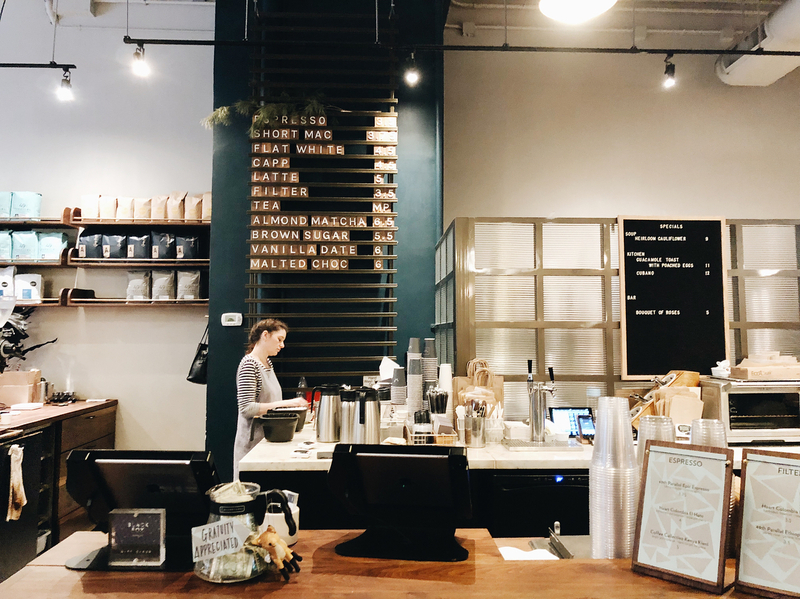 Whatever you just visualized, that’s Black Fox Coffee Co. With tiled flooring, long wooden tables, wire sculptures, and little bursts of greenery, Black Fox is as Instagrammable as it high-quality. Which is why it packs in downtown workers looking for a coffee fix, cool vibe, and trendy snacks. And by trendy, yes, we mean Ricotta and Roast Sweet Potato Toast and Acai Smoothies. Named for the Voyager spacecraft, this shop has a trippy sci-fi vibe that science and space-lovers will dig. Tin lines the walls and the coffee bar looks like a high-tech heater, but the lightly roasted, seasonally fresh coffee (coming all the way from Denmark) is warm, dark, and delicious. For eats, try out Nutella Toast topped with bananas and cinnamon or their Chia Seed Pudding made with almond macadamia milk, honey, and sliced almonds. Plus, you might get some inspo for your next Halloween costume. NYU students keep the Greenwich Village location of this rustic-chic venue packed from open to close. Meanwhile, their East Village shop is popping with youth and post-grads who need the extra jolt to get through their long days of hourly wages. Whichever Third Rail you go to, you can’t go wrong with coffee classics, but for an accompanying treat, try out their Ovenly Scones. 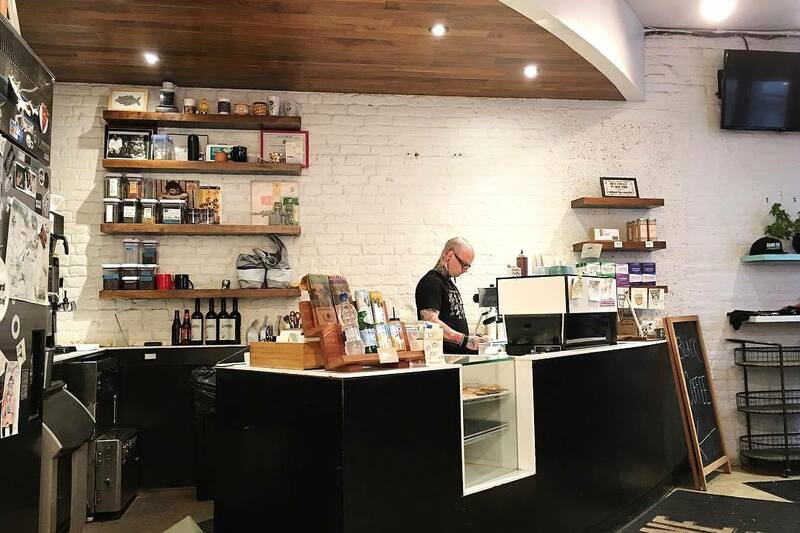 With 10 cafes scattered all around the city, Birch is a convenient grab ’n’ coffee shop with rich, earthy coffee, a laid-back vibe, and rustic furniture. 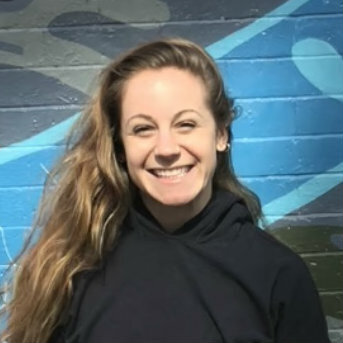 They have various non-dairy milk options—including hemp milk—which is a total win for vegans, but what they really pride themselves on is creating a sense of community amidst the chaos of New York City. Their cups have “Hello my name is___” printed on them, each location has a “take a book, leave a book” library, and every seat in the house is cozy. 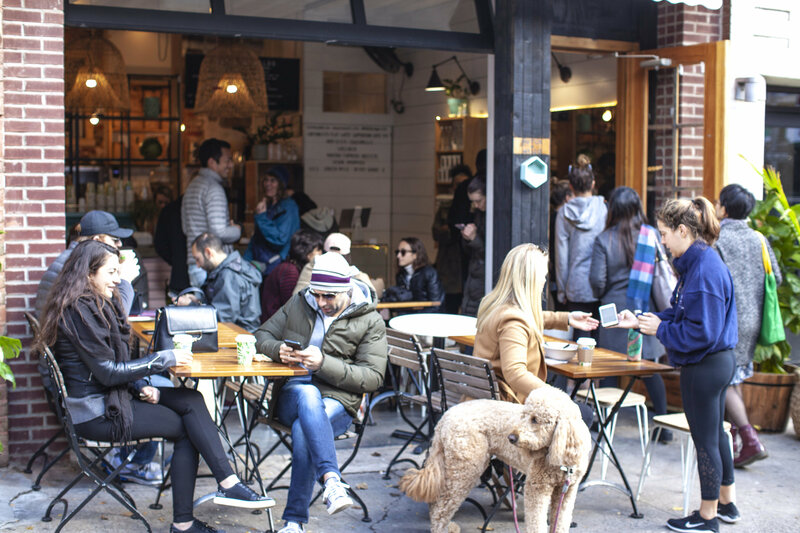 Hutch & Waldo is a gift to the Upper East Side, where Starbucks reigns and local-vibe coffee shops are as rare as a smiling New Yorker. But seriously, Hutch & Waldo is a diamond in the rough. The cozy residential feel is a great retreat from the busy NYC streets. And the coffee is spectacular; their cappuccinos and cold brews are rich, flavorful, and top-notch (and a little pricey). But for real flavor at a super-affordable price, try their bagel bowls — they’re under $12 and full of eggy, avocado-y, cheesy goodness. 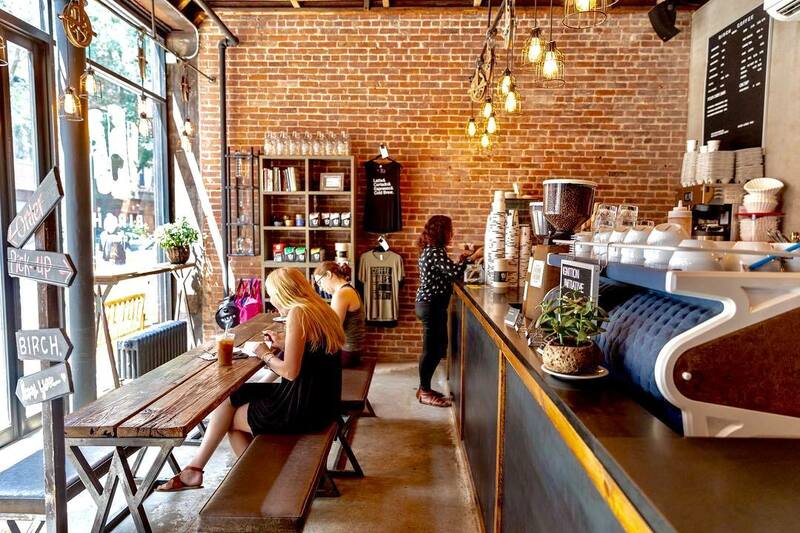 This designer-frequented hub is a Williamsburg fave. Thanks to its Australian-inspired bevs and eats, Sweatshop stands out because its offerings are damn good. One of their most popular drinks is the Sparky, which is made with iced espresso, tonic water, and lime, but you can’t go wrong with a classic cold brew or coffee drip. Fitt Tip: this place fills up fast on both the weekdays and weekends, so get their before the 9am freelance rush to snag a seat. Their first cafe opened in 1996 on Irving Place in Gramercy Park. Today, Irving Farm has eight (soon to be nine) locations across Manhattan. Yep, they must be doing something right with those coffee beans. The drip coffee and espresso are tops, but whether you’re craving a macchiato, cortado, or cold brew, you can’t go wrong. And if you want carb-packed, they’ve got sweets. Fitt Tip: the seasonal pumpkin bars are a can’t miss. After Starbucks, Think Coffee is probably the most-popular coffee joint in the city. With 11 locations scattered between Brooklyn and Manhattan, Think does more than serve (highly) caffeinated drinks. They also want you to feel good about your coffee, and not in cheesy way. With every purchase, you support projects like housing reconstruction in Colombia, feminine hygiene in Ethiopia, or clean water access in Nicaragua. The shop is also laid out to accommodate Wi-Fi-seekers, so bring your laptop (or hey, maybe a good book). 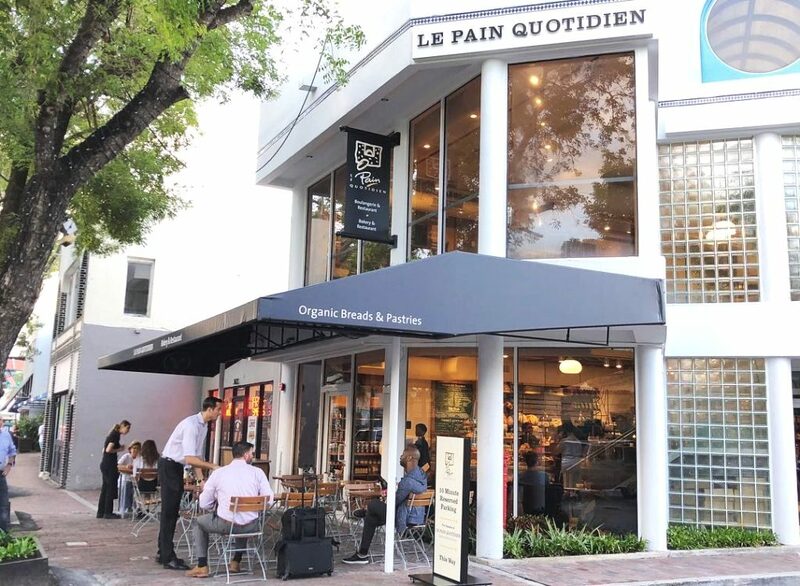 Le Pain Quotidien’s java is as good—and as organic—as you’re going to get from a popular NYC lunch spots. All the coffee beverages (espresso, cold brew, pot, and americano) are organic, and if you want something a little spicier, opt for the turmeric latte instead. While you’re there, try out their matcha muffin or avocado toast for the ultimate superfood breakfast. Plus, with over 30 locations in Manhattan, you’re never too far from a caffeine jolt. Maman is an influencer and freelancer heaven. With classic blue floral printed to-go coffee cups, rustic decor, and ‘grammable accessories abound, you could spend countless hours taking feed-worthy pics or cranking out work surrounded by cute decor while sipping cappuccino, French press, or cold brew. And if you’re hungry, you’re in luck because they serve brunch in the back (you can’t go wrong with waffles) and you can order pastries to stay. 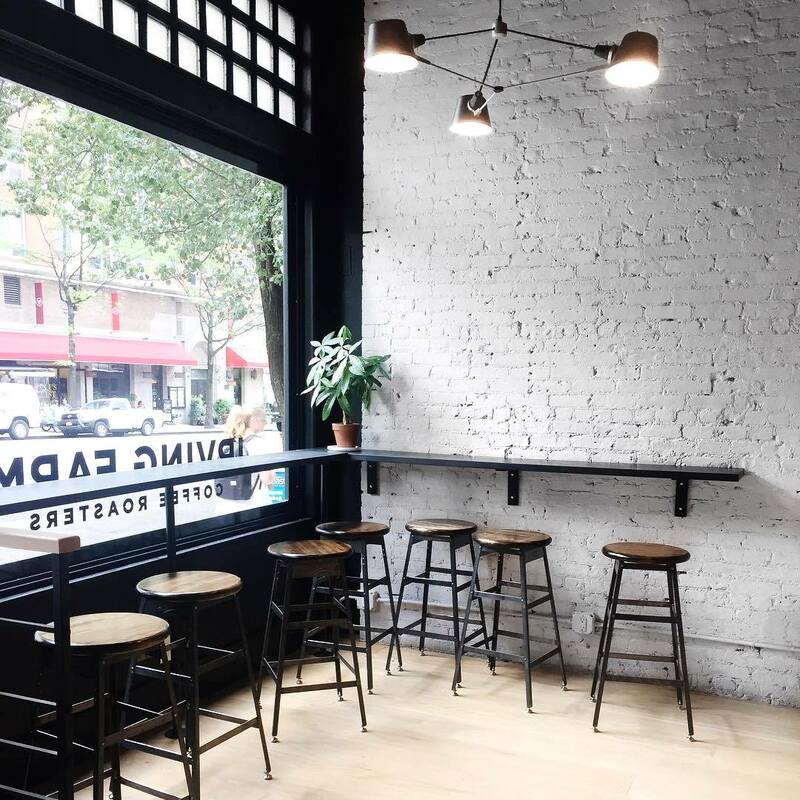 Step inside any of Maman’s various locations around the city—currently there are five—for a good cup of joe, a pic, and some quality people-watching. El Rey is a Lower East Side getaway with charming quarters. 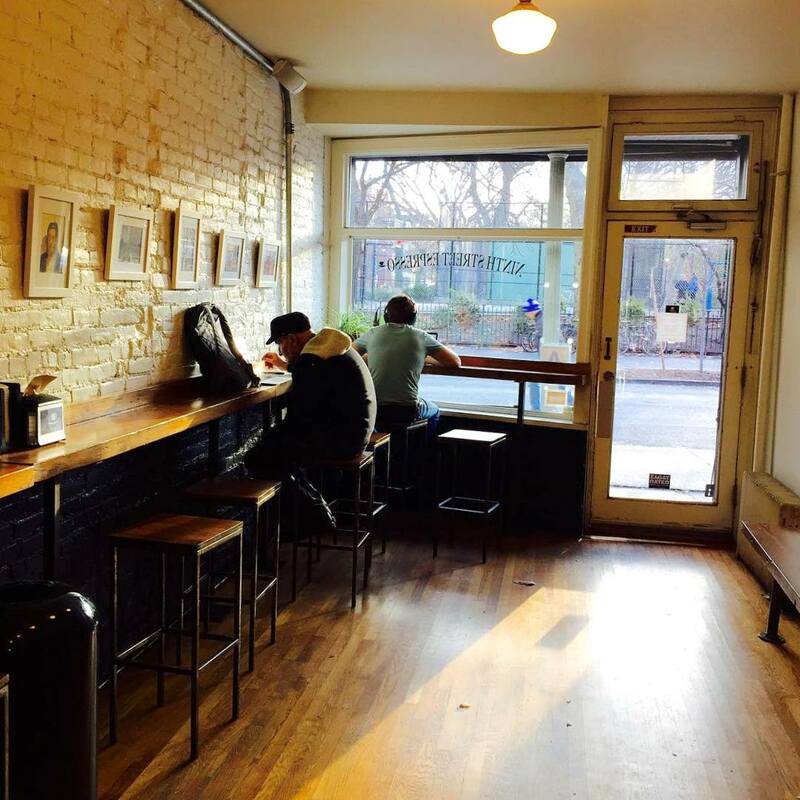 The intimate space is perfect for a coffee date, solo lunch, or on-the-run hot bev. If you have the time, make sure to also order something to eat. The Kale Salad is their classic, but if you want something more protein packed, the Diablo Chicken Bowl or Farro Salad with a fried egg are an easy “yes!”. Just don’t forget to take a picture in front of the neon sign or zebra-inspired backdrop. Happy Bones is a tiny and quiet Little Italy shop where you are immediately transported away from the go-go-go vibe of New York. 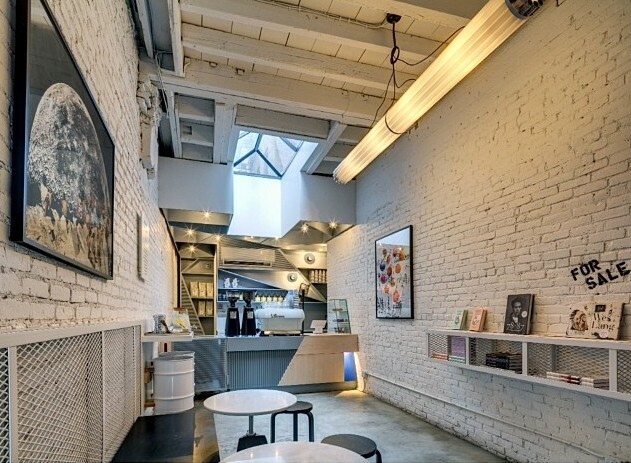 This minimalistic coffee shop features local art viewings, stacks on stacks of art journals and indie publications, stark white exposed brick walls, and signature tortoiseshell spoons for sale. Oh, and let’s not forget the delicious espresso. Relax with your Flat White (Happy Bones’ specialty) or expresso with the morning paper.